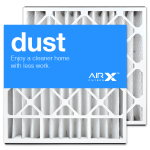 If you want to protect your HVAC system, keep your house a little cleaner, and remove a few nuisance particles from the air you breathe then yes, this is the filter for you! Not everyone needs to get rid of odors, and not everyone is overly sensitive to allergens and other, more harmful, particulates in their air. Nominal Dimensions 20 x 20 x 5"
Actual Dimensions 19-11/16" x 20-11/16" x 4-15/16"